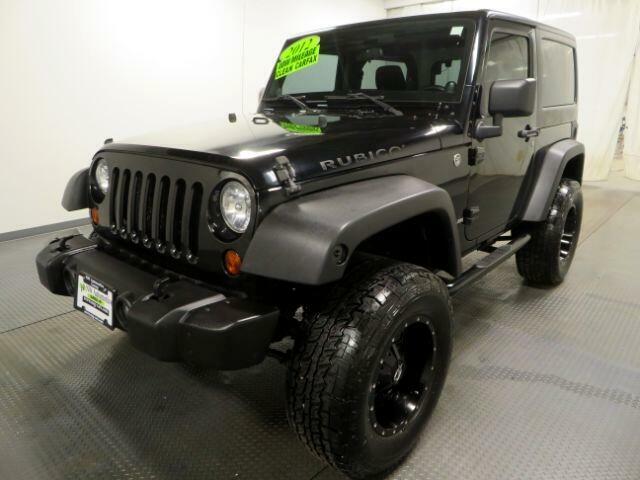 Meet our Clean CarFax 2012 Jeep Wrangler Rubicon 4x4, shown in our rugged looking Black paint scheme. If you have a real need for all-season capability, or simply a strong desire to depart the beaten path, our Wrangler is a tough recipe to beat. Powered by a 3.6 Liter V6 that produces 285hp mated to a 6 Speed Manual transmission. and almost as much torque. This Four Wheel Drive will allow you to maintain civility or allow you to carve your own path where ever you see fit thanks to the locking differentials, Rock-Trac HD transfer case, and gas charged shocks. The Rubicon goes a little beyond basic by offering Air Conditioning, great looking satin wheels, power windows/locks, and special badging. With city streets and freeways providing an increasingly unfriendly atmosphere to standard, car-based suspensions, large BFGoodrich mud tires and real ground clearance are increasingly handy for the committed urbanite. If you get the urge to take an open-air cruise, just remove the top, put on some shades, crank up the Infinity sound system, and hit the road! A strong safety cage surrounds you, multistage airbags protect you, and Hill-start and stability control help you along the way. Our Rubicon offers all of the legendary rock-climbing ability of America''s favorite off-roader, with a dose of comfort to go along for the ride! Print this page and call us Now...We Know You Will Enjoy Your Test Drive Towards Ownership! Internet Special, Interest rates starting Low as 1.99 for Qualified Buyers, Special financing available, Low monthly payments, No Credit, Bad Credit with still have Lenders that can Finance you! Log onto our direct website Nag-cars.com Two Location to choose from...Price Reflects Discount for Cash Buyers. Sales Tax, Title, License Fee, Registration Fee, Dealer Documentary Fee, Finance Charges, Emission Testing Fees and Compliance Fees are additional to the advertised price.